From what makes us right or left-handed to why we develop autism, there are many mysteries about the human brain we are yet to solve. Some of these questions can be answered by studying the brains of other animals like mice, for example. But this isn’t possible for other phenomena that are unique to human brains. Researchers are now growing hundreds of tiny human brains in labs, in an attempt to understand what gives us unique disorders like autism and schizophrenia – and the method they use to create these brains is surprisingly simple. 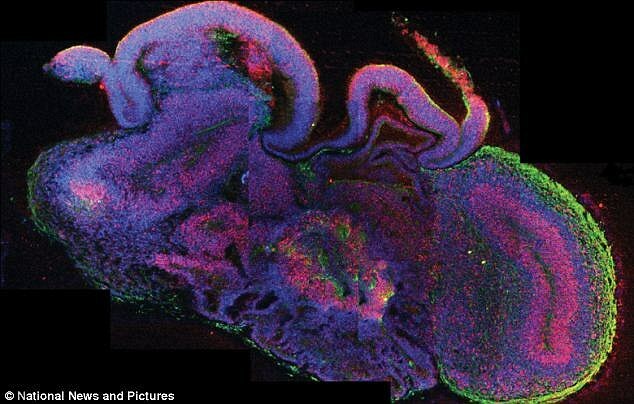 ‘Organoids’, three to four millimetres across, have a structure similar to that of an immature human brain. Just like a normal brain, the organoids are divided into grey matter, made up of neurons, and white matter, a fatty tissue composed of their spindly ‘tails’. Each is also composed of specific regions, like the human brain. But they look nothing like a brain, instead they are watery blobs floating in pale liquid. Scientists across the world are developing cerebral organoids, or mini brains, to solve a variety of problems. Many of these groups are trying to understand other complex neurological diseases that are unique to humans, like autism and schizophrenia. One such researcher is Madeline Lancaster, who works at the Medical Research Council (MRC) Laboratory of Molecular Medicine in Cambridge. The brains are created using cells. The team uses skin cells but, they could start with any cell type. 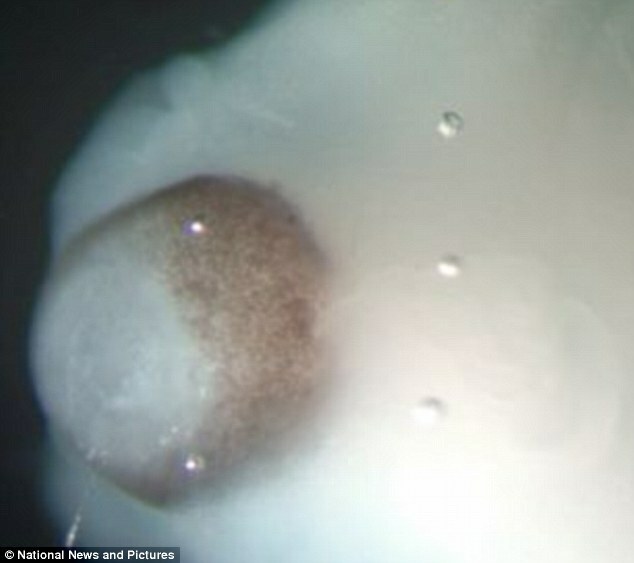 ‘The brains develop in the same way you would see in an embryo,’Dr Lancaster told BBC Future. They turn these cells into stem cells, using proteins, and as these grow, brain cells begin to develop. The researchers starve the cells and, for an unknown reason, the brain cells seem to be the most robust ones, so they survive. These brain cells are placed in a special jelly and put into an incubator. The researchers in Dr Lancaster’s lab are using these brains to study a variety of conditions. ‘Our current interests focus on other neurodevelopmental disorders like autism and intellectual disability, by introducing mutations seen in these disorders and examining their roles in pathogenesis in the context of organoid development,’ Dr Lancaster says on her project page. HOW TO MAKE A BRAIN The brains are created using human cells as a starting point. The team uses skim cells but, they could start with any cell type. These brain cells are placed in a special jelly and popped into an incubator. 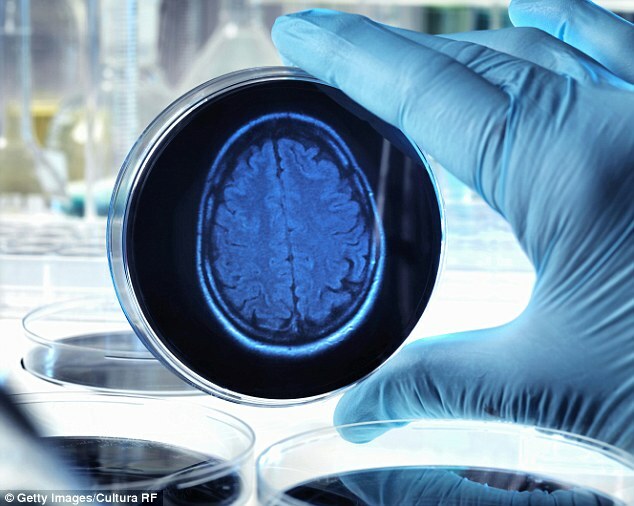 The first ‘brain in a bottle’ was grown by stem cell scientists in 2013, who hoped it would lead to treatments for neurological and mental diseases. 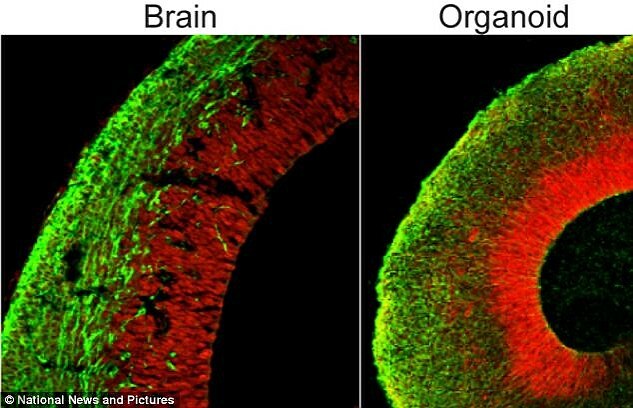 The ‘organoids’, three to four millimetres across, have a structure similar to that of an immature human brain. Professor Juergen Knoblich, of the Institute of Molecular Biotechnology in Vienna, derived the iPS cells (induced pluripotent stem cells) from the connective tissue of a patient with microcephaly. This is a rare but devastating genetic disorder in which brain size is dramatically reduced, leaving the sufferer with severe mental disability. Like many neurological conditions, the disease has been difficult to study in mice because they do not share the same brain complexity as us. The team used a 3D matrix scaffold that mimics the environment of a human embryo and special lab devices, called spinning bio reactors, which produce nutrients and oxygen, to grow the brains. ‘Ultimately, we would like to use them to study more common disorders like schizophrenia or autism as it has been shown the underlying defects occur during the development of the brain,’ Professor Knoblich said at the time. The original goal was to produce a biological tool that can be used to investigate the workings of the brain, better understand brain diseases, and test new drugs. The goal for many researchers is to develop a brain exactly like a human’s. But some researchers say this would be a step too far. Dr Martin Coath, from the Cognition Institute at the University of Plymouth, questioned why anyone would ever want to create a ‘real’ human brain. ‘A human brain that was ‘fully working’ would be conscious, have hopes, dreams, feel pain, and would ask questions about what we were doing to it,’ he said. ‘Something we have grown in the lab, but on a much simpler level than a human brain, might be hooked up to electronic eyes, ears, and hands and be taught to do something – maybe something that is as sophisticated as many simple living creatures.